We are motivated by the belief that yoga clothing can be creative, versatile, and most of all fun to wear. Lainey Morse never planned to become a goat yoga mogul, but in case you missed it, Goat Yoga quickly took the world by storm. The idea, born almost by accident during a child’s birthday party on her farm, quickly became an international sensation, gaining fame far outside the fences of the No Regrets Farm in Albany, Oregon. 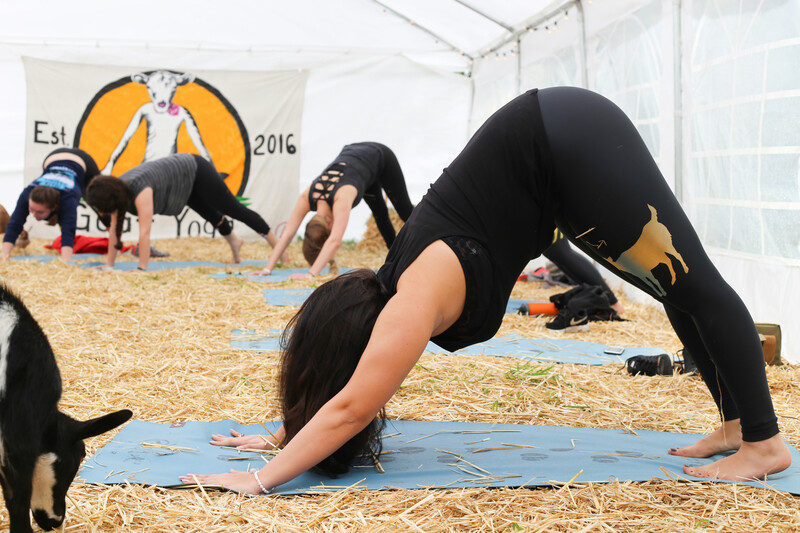 For classes ranging from $30 to $50, Aspiring yogis of all levels can take a yoga class in a field space full of goats, complete with stunning views of the Willamette Valley. While the goats do not participate in any downward dogs or warrior poses, they do meander freely through the crowd to stand on yogis’ backs and cuddle, and occasionally nibble on the mats. 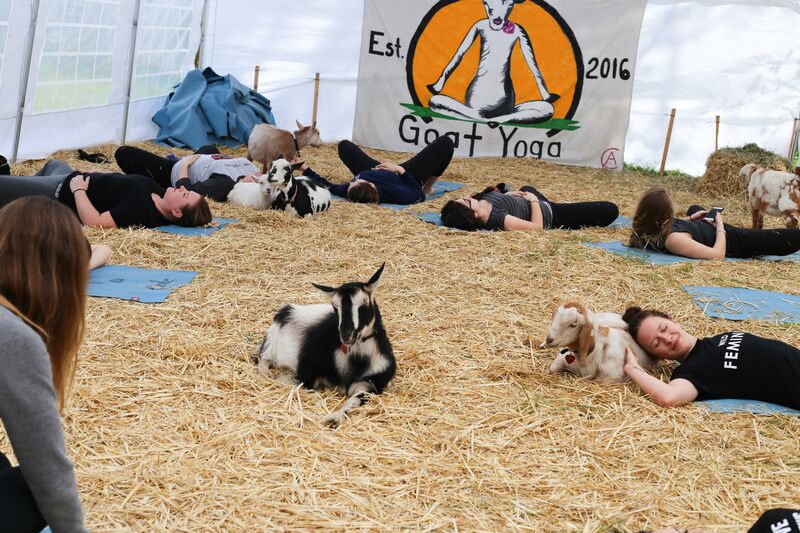 Customer testimonials validate Morse’ hopes that this new therapeutic environment brings an additional level of peace and relaxation by having baby goats prance around the mats. Headquartered an hour away in Portland, Evolve Fit Wear loved Goat Yoga so much that the brand decided to pursue a collaboration with Morse on a goat-inspired activewear apparel line, complete with yoga leggings, tees and yoga mats. Available now, customers can purchase apparel designed with goat graphics, sayings like “You’ve Goat This,” and goat footprints. 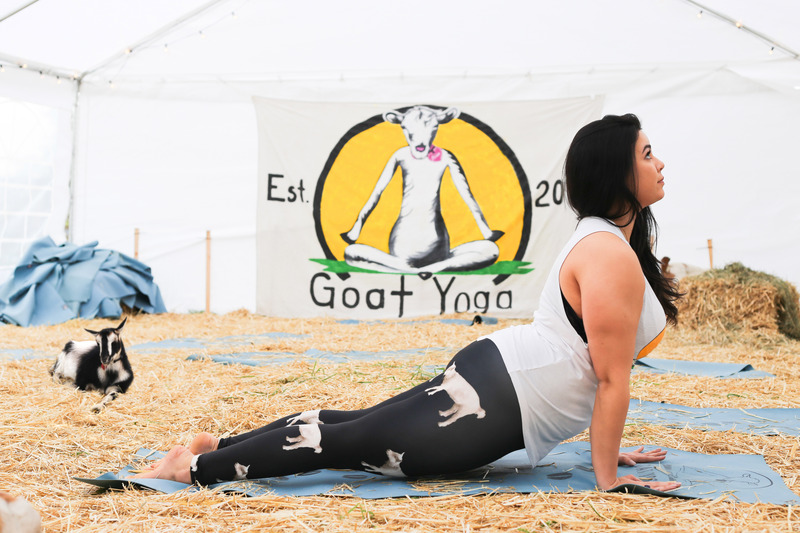 Created by Lainey Morse on her farm in Albany, Oregon, Goat Yoga has become an international sensation thanks to the surprisingly compatible pairing of goats and yoga. At No Regrets Farm, the goats do not participate in any downward dogs or warrior poses, but they do meander freely through the crowd to stand on yogis’ backs and cuddle, and occasionally nibble on the mats. Lainey Morse hopes to one day specialize in animal-assisted therapy for people suffering grief or abuse as well as people with special needs or disabilities. For now, she hosts Goat Yoga classes in hopes of bringing another level of harmony and peace to your yoga flow by having barnyard animals meander through the class. Goat Yoga X Evolve: Here at Evolve we love Goat Yoga so much that we decided to team up with No regrets Farm to bring you exclusive leggings designed for the goat yogi in all of us. Evolve's Annie The Goat Long Legging features an all over goat print inspired by No Regrets Farm's very own barnyard star, Annie. The Gold Goat Yoga Legging features a golden silhouette of at goat on the left side, with hoof prints meandering up the back right leg, perfect for expressing your fondness of goats any day of the week! Both legging designs are made of a moisture wicking, quick drying fabric, with a wide supportive waistband, ensuring you stay comfortable throughout your flow whether it’s in a field of goats or in a goat-free studio.